The Midland had an opportunity and a big problem: the opportunity was simple, to crack the market in Manchester – Cottonopolis. The problem? The London & North Western Railway and their chairman, ‘Captain’ Mark Hewish. The cotton mills of Victorian Manchester: a strategic objective for the Midland Railway and a vital step on the route to the west coast port of Liverpool. Birmingham Railway to Rowsley, well on the way into the Peak. There was bad news however – the day the Act of Parliament to build the railway was signed, the London & North Western took over the London & Birmingham. The Midland now had a problem – they were sleeping with the enemy and the enemy wanted them well away from Manchester. Beyond Rowsley, the Midland was pretty safe: it had a route surveyed through Bakewell and Chinley into Manchester but south of Rowsley, a contingency was necessary – Wirksworth came into the frame. The plan: build a new line to Rowsley, via Wirksworth, to avoid the existing route. An early 20th century Midland Railway line diagram annotated to include the approximate path of the proposed continuation of the Wirksworth Branch to Rowsley. (Courtesy of the Midland Railway Society). Click on the diagram for a larger version. 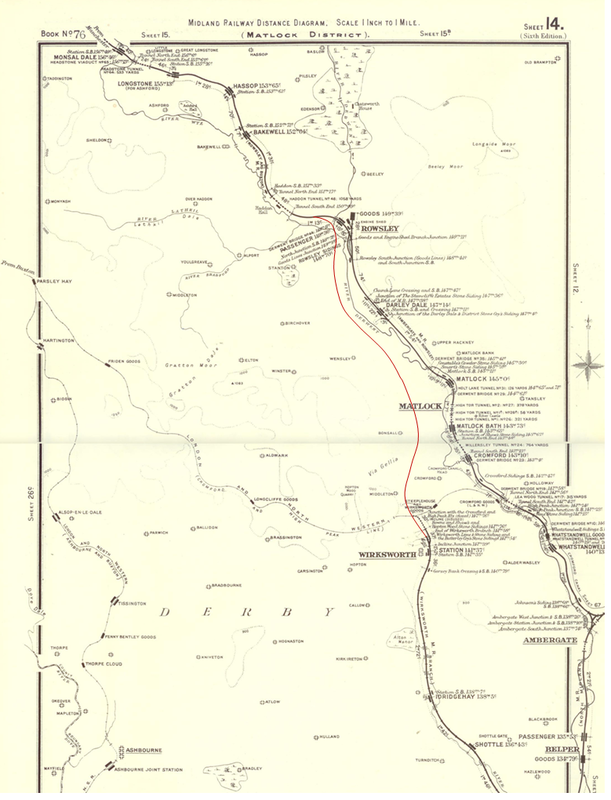 An early 20th century Midland Railway line diagram annotated in include the approximate path of the proposed continuation of the line from Wirksworth to Rowsley. Map courtesy of the Midland Railway Society. Click on the image for a larger version. The London & North Western and Mr. Shaw were placated. Ironic really, Mr. Shaw was bothered about his quarry losing business from foreign imports (e.g. Leicestershire) and yet his business flourished despatching loads of stone by train a few years later. The line opened to modest celebrations and services commence. A service of three return trips a day from Derby sets the pattern for the line’s passenger services: goods would be the line’s primary source of income. And what of the Continuation to Rowsley? This was the big ‘what-if’ of the Wirksworth Branch. By the time the line had opened, the LNWR had effectively pulled-out of the original Rowsley line and so the extension was quietly dropped. Upgrades to the route and signalling of the Duffield to Wirksworth section to support a through service. Interestingly, a landslip at Whatstandwell on the direct Rowsley route in 1897 led to the plan being briefly revived but after that no more was heard. 150 years on and there is still evidence of the Rowsley Extension at Wirksworth. To the left where the line terminates there would have been a tunnel mouth for a nearly mile-long tunnel under Cromford Hill. 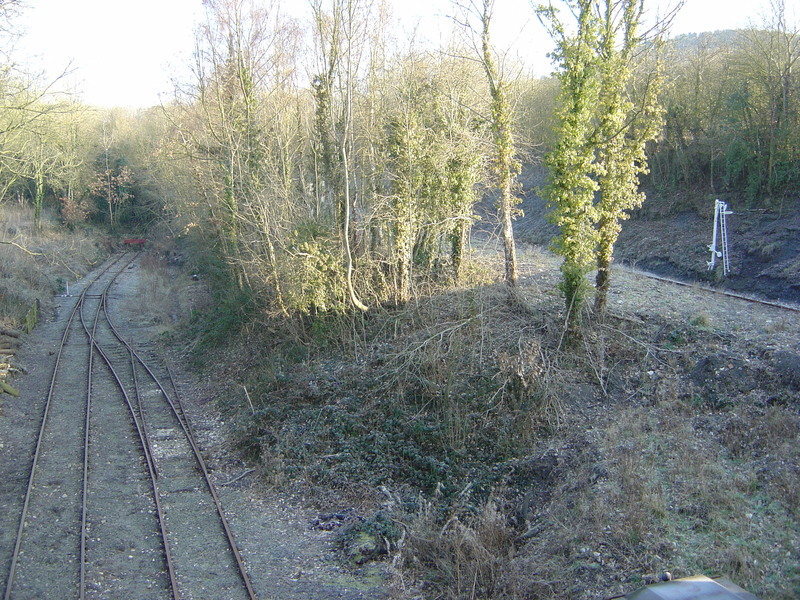 To the right, the quarry line that once extended to the Cromford & High Peak line still remains running to Ravenstor Halt.